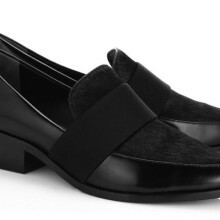 Pinch me I’m dreaming, these shoes are literally the most gorgeous flats I’ve seen in a while. It’s Milan Fashion Week so it seems only apt that I include a pair of shoes from an Italian brand (even if the Creative Director is of British origin). Pollini is a traditional Italian footwear label that’s been around since the 50’s. Once under the helm of Jonathan Saunders, SS11 saw Nicholas Kirkwood appointed Creative Director. Much more of a daywear accessory brand than Kirkwood’s own, Pollini provides transeasonal footwear in luxurious Italian fabrics and playful shapes. In an interview for Browns, Kirkwood explained that for SS14 he drew inspiration from the Pollini archives, in particular from the seventies, when brogues and menswear inspired footwear were the signature shapes. From the fringed leather front flap and patent buckle, to the contrast sole and white polka dots, everything about these monks are perfect. The Pollini monks cost £430 and you can buy them here.